A nano peel is, as the name suggests, an ultra fine peel. It is low impact, has little discomfort in the micro-needling phase so requires no anaesthetic cream, and leaves only minimal redness afterwards. Sophie is interested in taking care of her skin, has a good diet and daily skincare regime, but wanted to find out what could be done to keep it in tip top condition. She was also attending an important event and wanted to look her best. Two good reasons to try our bespoke nano peel! Before: Skin is cleansed and make up removed in preparation for treatment. Followed by a preliminary exfoliating treatment – a light tingling experience to shed dead skin. 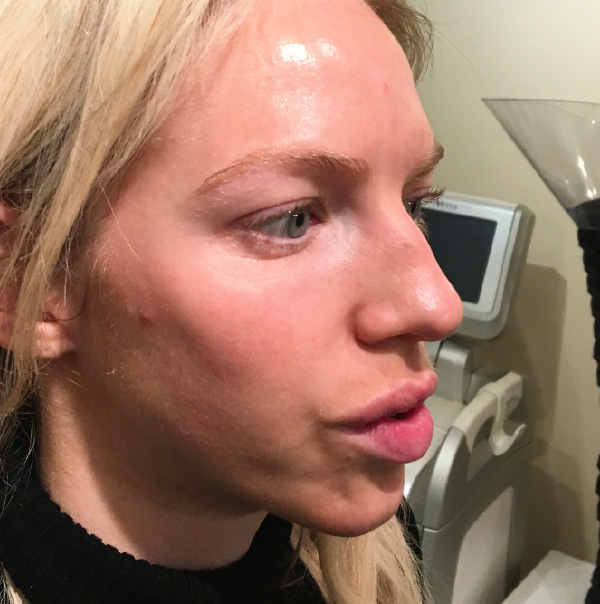 Immediately after: Low-impact microneedling which creates thousands of tiny micro-channels into the skin allows deep penetration of a revitalising serum. Immediately after: A small amount of redness is visible, but skin looks refreshed and glowing. After: Skin tone is healthy, smooth and very even. Imperfections and redness are diminished. After: Imperfections and redness are diminished. After: A natural “peaches and cream” complexion – without make up! Following a consultation with aesthetician, Collette, a bespoke peel was decided upon. A nano peel is, as the name suggests, an ultra fine peel. It is low impact, has little discomfort in the micro-needling phase so requires no anaesthetic cream, and leaves only minimal redness afterwards. A cocktail of skin-boosting peptides, vitamins, and hydrating hyaluronic acid are infused into the skin, to stimulate collagen production and hydrate deeply. It is important to stay out of the sun for 24 hours afterwards and wear SPF cream. After a few days, there may be a small amount of light skin peeling which is very manageable and the outcome is a beautiful natural glow.